A Transient Ischemic Attack or TIA is very similar to a stroke, but usually lasts only a few minutes and does not leave any permanent damage behind. It is quite often dubbed as the ‘mini-stroke’ and statistics point that one person in every three to experience the TIA experiences a stroke itself within a year’s time of it. The TIA hence, can be viewed as a warning sign and also as an opportunity to make amends and changes to prevent that stroke, which is now very probable and close at hand. TIAs last only a few minutes and the symptoms disappear in an hour’s time. The symptoms are the same as that of a stroke which is in the early stages of setting in. The numbness is felt on the face and arms, especially on one side of the body. Blindness may also be felt, on one eye or both. The speech is slurred and there is dizziness and lack of overall body coordination. The causes of the TIA are again, the same as that of an Ischemic Stroke. 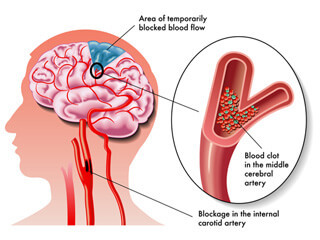 In an ischemic stroke, there is the complete blockage of the blood supply to the brain, whereas here, the blockage is rather brief which is the reason why there isn’t any permanent damage to the body. The buildup of cholesterol-containing fatty deposits known as plaques is the main cause. The blockage could be in an artery or on a branch that supplies the brain. These plaques have the potential to reduce the flow or even cause the formation of a clot. A moving clot inside an artery that supplies the brain from the heart can also be a reason. At the time of the TIA, help must be sought immediately. The very event alone signals the formation of obstructions in the blood vessels – a sign that means that things aren’t really great at the moment inside the blood vessels and there are things to be done and changed. Regarding strokes and TIAs, there are factors like family history and age which come into play which can’t really be controlled. On the other hand, one’s lifestyle and habits are all controllable contributing factors. If one is a smoker, quitting is vital after the TIA. Poor nutrition, heavy drinking, and physical inactivity must be immediately dealt with. Blood pressure and cholesterol levels also must be brought down as soon as possible. If you would like to know more about TIA or if you are seeking treatment for it, please do get in touch with us at Plexus.